For quantitative determination of glutamate dehydrogenase activity. GLUTAMATE DEHYDROGENASE (GLDH) is an enzyme which catalyzes the interconversion of glutamate and a-ketoglutarate. 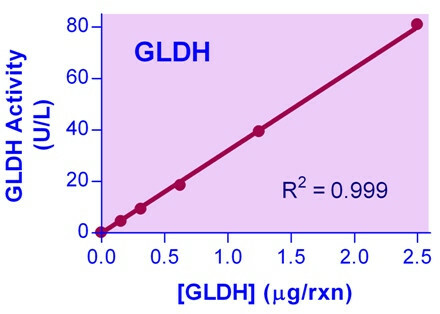 Elevated blood serum GLDH levels indicate liver damage; thus, GLDH plays an important role in the diagnosis of liver disease, especially in combination with aminotransferases. Transgenic plants expressing microbial GLDHs are improved in tolerance to herbicide, water deficit, and pathogen infections. 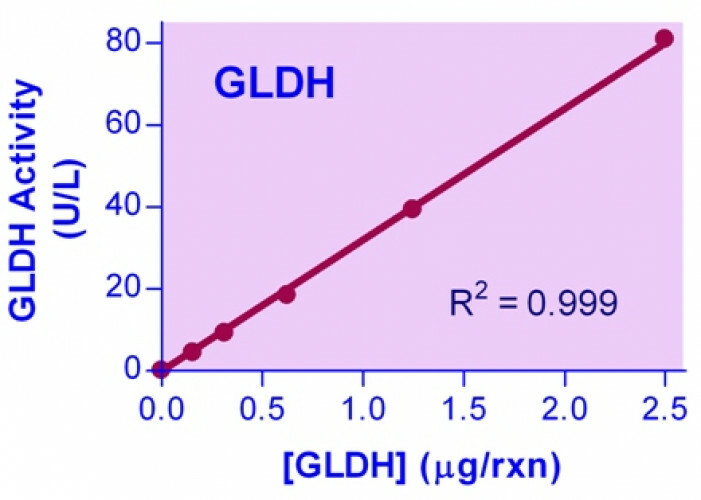 BioAssay Systems’ non-radioactive, colorimetric GLDH assay is based on the reduction of the tetrazolium salt MTT in a NADH-coupled enzymatic reaction to a reduced form of MTT which exhibits an absorption maximum at 565 nm. The increase in absorbance at 565 nm is directly proportional to the enzyme activity. Applications For quantitative determination of glutamate dehydrogenase activity. References Assay: Liver Cells in Sea Bream (Pubmed). 2. Laura BP et al. (2015). Lasting effects of butyrate and low FM/FO diets on growth performance, blood haematology/biochemistry and molecular growth-related markers in gilthead sea bream (Sparus aurata). Aquaculture. 454 (2016) 8?18. 1. Ballester-Lozano, GF et al (2015). Comprehensive biometric, biochemical and histopathological assessment of nutrient deficiencies in gilthead sea bream fed semi-purified diets. Br J Nutr.114(5):713-26. Assay: Liver Cells in Sea Bream (Pubmed).